Ponte Vecchio - Old Florence Bridge - FLORENCE LIVE! Built in ancient times by the Etruscans, the bridge has weathered many storms - and storming by invading legions. Because of its location over the widest part of the Arno River, the bridge has been rebuilt and restored many times throughout its long history. And it has changed with the times. 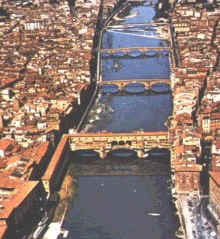 Originally the bridge was built to allow access over the Arno. Slowly, with so much traffic going over it, a few enterprising parties decided to set up shop on the bridge itself. As that early traffic consisted primarily of traveling soldiers, it isn't surprising that the first merchants to set up shop were blacksmiths, butchers, and tanners. 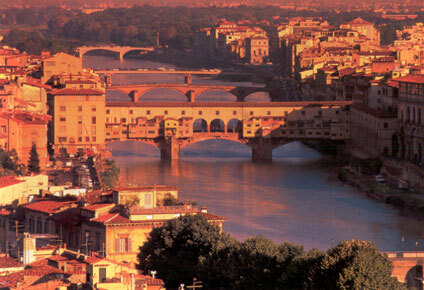 During the Middle Ages, Florence was hit hard by the Plague. Half of Florence was wiped out the by the Black Death, and the remaining populace became suspicious of their old ways of living. It was also around this time that the powerful Medici family moved into Florence. They brought with them vast wealth and an appreciation for the finer things in life. Seeing those older merchants using the Arno River as their own personal sewer system didn't exactly fit in with their ideas for the beautification of Florence. Soon the blacksmiths, butchers, and tanners were replaced with goldsmiths and artists, and the number of shops increased tremendously. Between 1565 and 1800, an upper level was added, as was a back row of shops. 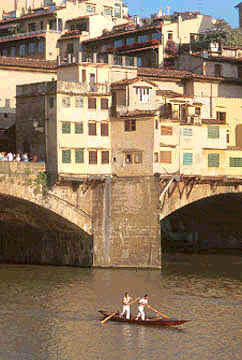 All this increased trade not only helped Florence grow, but the new shops also gave the bridge structure and strength. The Ponte Vecchio is the only of Florence's bridges to have survived WWII, and in 1966, when a massive flood wiped out the shops on the bridge, the bridge itself was strong enough to withstand the roaring waters. The Ponte Vecchio embodies the progress of humanity because it has come from carrying soldiers to battle, to open commerce, to a vast gathering place for peoples from all walks of life.